On February 5, 1991 owner Art Modell of the Cleveland Browns introduced Bill Belichick at a press conference as the eighth head coach in franchise history (not counting interims). He received a five-year contract and, two months shy of his 39th birthday, was the youngest head coach in the NFL at the time. Belichick had most recently been defensive coordinator of the New York Giants, who had edged Buffalo in the Super Bowl less than two weeks previously. He beat out Mike White, the quarterback coach of the Los Angeles Raiders, to succeed to the job that Bud Carson was forced to vacate after nine games of his second season at the helm (Jim Shofner was the interim coach for the last seven contests). The son of Steve Belichick, who played for one season in the NFL as a fullback for the Detroit Lions in 1941 and went on to become a highly regarded college scout, Belichick was a graduate of Wesleyan University in Connecticut. His first NFL assistant coaching job was with the Baltimore Colts in 1975 at age 23 as a low-paid special assistant, essentially studying game film and running errands. He moved on to more significant positions with the Lions and Broncos before joining the Giants in 1979. In New York, he started out coaching special teams under Head Coach Ray Perkins, added linebackers to his responsibilities, and, retained by Bill Parcells, moved up to defensive coordinator in 1985. The Giants won two Super Bowls during Belichick’s tenure and the defense was a key to the team’s success. Belichick already had a reputation as a hard worker with strong organizational skills, who was also intense and a highly knowledgeable student of the game. He inherited a team that was coming off of a dismal 3-13 record in 1990 after five straight playoff seasons. In selecting his staff, Belichick retained one holdover assistant, offensive line coach Hal Hunter, and included Nick Saban as defensive coordinator and Gary Tranquill, a career college assistant, to coach the quarterbacks. The Browns improved to 6-10 in ’91 and were noticeably more competitive. Veteran QB Bernie Kosar, who had taken a beating in recent seasons, was sacked 41 times but also passed for 3487 yards and 18 touchdowns while giving up nine interceptions. The big-back combination of FB Kevin Mack and RB Leroy Hoard was effective and the receivers, led by WR Webster Slaughter, were capable. DT Michael Dean Perry initially held out but came back to make the Pro Bowl for the third straight year while providing leadership to a young defensive line. 36-year-old LB Clay Matthews was utilized primarily for his skill as a pass rusher and did well although injuries decimated the defensive backfield, where SS Eric Turner, the team’s first draft choice, missed the first half of the season due to a stress fracture in his foot but came on strong when he finally took the field. The record was slightly better at 7-9 in 1992, although the Browns were at 7-6 before losing their last three contests. Kosar was limited to seven games due to a broken ankle, and with backup QB Todd Philcox also going down, journeyman Mike Tomczak accumulated eight starts. Rookie FB Tommy Vardell joined the corps of power running backs while HB Eric Metcalf was outstanding as a third-down back and punt returner. There was retooling among the receivers, where WR Michael Jackson had a breakout season and ex-Giants TE Mark Bavaro was steady. On defense, Perry got off to a slow start and complained about his role but came on stronger as the season progressed. Matthews appeared to be ageless and he and DE Rob Burnett led the club with nine sacks apiece. Age and injuries were still an issue in the backfield. The 1993 season was highlighted by the dramatic, and controversial, decision to jettison Kosar from the team after seven games. The move was all the more stunning because Vinny Testaverde, the veteran obtained from the Buccaneers to back up Kosar, was injured and the team had to go with Philcox. The club lost four straight games, but Testaverde performed well when he took over the starting job and the Browns duplicated their ’92 record at 7-9. Vardell led the team in rushing and Metcalf was an All-Pro in his all-purpose role. WR Mark Carrier, another ex-Buc, teamed well with Jackson and the line, built around center Steve Everitt, was much improved. The defense was strongest on the line and in the backfield, but the linebackers were showing their age and lack of speed. The pressure was on Belichick to show greater results in 1994, and the Browns responded by going 11-5 and reaching the playoffs. Testaverde’s performance was uneven but the play of other personnel on offense helped. When Vardell went down with a season-ending knee injury, Hoard ably stepped in and was named to the Pro Bowl along with Metcalf. Four starters on defense also made the Pro Bowl, including Perry, Burnett, Turner (who was also a first-team All-Pro by AP and the Pro Football Writers), and ex-Giants LB Pepper Johnson. Both of the team’s first-round draft picks, CB Antonio Langham and WR Derrick Alexander, contributed significantly. Having finished second in the AFC Central, the Browns defeated New England in the Wild Card playoff round before losing to the division-rival Steelers at the Divisional level. It was a solid year and expectations were high for 1995. Those high expectations failed to materialize. Cleveland got off to a 3-1 start, lost three straight, and was at 4-4 before the bottom fell out. Modell announced that the franchise would be moved to Baltimore in 1996 and the distracted club finished up at 1-7 for an overall record of 5-11. Testaverde was benched for four games and WR Andre Rison, who was brought in as a free agent from Atlanta at high cost to upgrade the receiving corps, proved a poor fit and became a negative presence in the locker room. The defense also slipped badly, and Turner was injured for half the season. After five years, Belichick’s tenure with the Browns came to an end. His overall regular season record was 36-44 and 1-1 in the postseason. He took over a team in dire need of rebuilding and had steadily done so, making the greatest progress on the offensive line and the defense. The team had drafted well and, except in the notorious case of Rison, made good veteran pickups to fill holes. 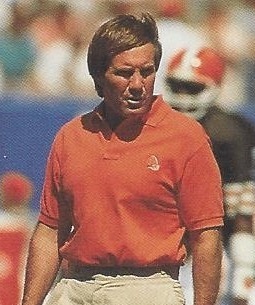 Belichick had drawn criticism for his dour demeanor, which alienated the media and fans, and his intensity wore thin, not least with Modell, who initially had given the coach a vote of confidence to go with the team to Baltimore in ’96, only to dismiss him instead (Belichick was succeeded by one of his mentors, Ted Marchibroda, under whom he had served in his first assistant coaching job). Belichick rejoined Bill Parcells, now head coach of the Patriots, in ’96 and went with him to the Jets the following year, acting as assistant head coach. He was set to replace Parcells with the Jets in 2000 but backed out to instead become head coach in New England. A year later, the Patriots won their first of six AFC titles and four Super Bowls (to date) under Belichick’s direction.